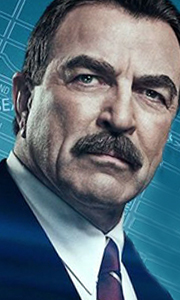 New York City Police Commissioner Frank Reagan (Tom Selleck) has a lot to be proud of...but his greatest pride is his family. His oldest son Danny (Donnie Wahlberg) is a streetwise detective who always gets the job done...even if that means bending the rules. As an Assistant D.A., his daughter Erin (Bridget Moynahan) passionately defends the letter of the law while she struggles to raise her daughter as a newly single mother. His younge..
NYPD detective Danny (Donnie Wahlberg) and his partner are endangered when a criminal with a grudge is released from prison. Meanwhile, his brother Jamie (Will Estes) adjusts to his new, debatably unorthodox partner on the force. Ex-commissioner Henry (Len Cariou) and his son Frank (Tom Selleck) experience a new bond when old family secrets are revealed. Danny finds himself in a situation that draws the family together to prove his inno.. The Reagan family dynamics continue to shift as they deal with everything from gambling and drugs to kidnapping and murder: Jamie (Will Estes) wrestles with his feelings for his new partner; Erin (Bridget Moynahan) and Jack (Peter Hermann) work to figure out their personal relationship; and Danny (Donnie Wahlberg) and Frank (Tom Selleck) clash over an internal investigation of Danny’s techniques. As the Reagans faces off against the FBI..
Own Blue Bloods Season 5 DVD from Deff, DVD, Blu-Ray & 4K Video Specialists - Free UK Delivery..
All 22 episodes from the sixth season of the US drama series following a family of New York cops headed by Frank Reagan (Tom Selleck). As well as the head of the family, Frank is the New York City Police Commissioner, following in the footsteps of his father, Henry (Len Cariou). Frank's children also share his passion for law and order: Danny (Donnie Wahlberg) is an NYC detective, Erin (Bridget Moynahan) works in the District Attorney's..
Own Blue Bloods Season 7 DVD from Deff, DVD, Blu-Ray & 4K Video Specialists - Free UK Delivery..
Own Blue Bloods Season 8 DVD from Deff, DVD, Blu-Ray & 4K Video Specialists - Free UK Delivery..